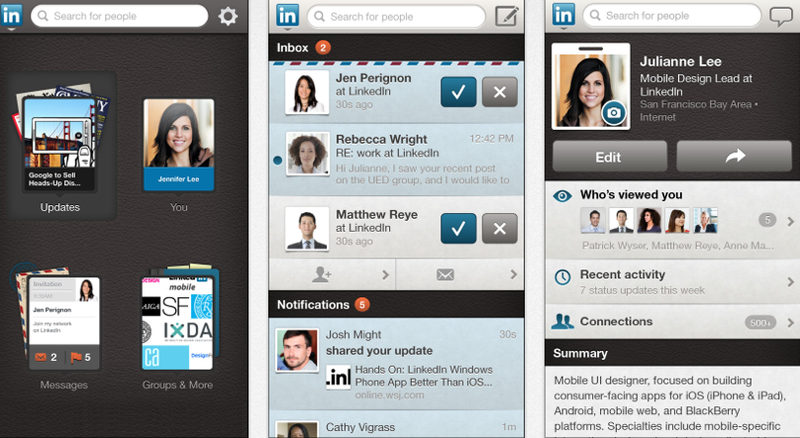 Today’s App Review is LinkedIn by LinkedIn Corporation. Although I have a LinkedIn account I don’t actively used it and only update it every once in a while. I often forget it is there until I am reminded by email that someone wants to connect with me. These usually come on my morning commute and I always decline the suggestion that I download the App instead of using the web-based option. When prompted this morning I eventually gave in and downloaded it. The email told me I had one new connection request. I managed to accept this request but found it impossible when it came to viewing this persons profile. My patience lasted a maximum of 5 minutes before I gave in and used the web version again. The way the App is designed presents you with four options; You, Updates, Messages and Groups&More. The You option works fine but I found it hard to find the profile of this newly added connection. Having just given the App a go again I still couldn’t find what I was looking for. For mobile Apps like these the App really does need to be user friendly. Facebook and Twitter work perfectly but LinkedIn should seriously take some advice from them. Mobile Apps are meant to be designed for on the go and the search function was getting me no where fast. Another massive downside is that I could not edit my profile on my iPad. I am using iOS devices more and more all the time and use them more than I do my laptop these days so accessibility is important. Sure I can update on my phone but for something like this I would prefer a bigger screen. Also in the short period I used the App it crashed 6 times. Right now I have moved back to the web based version and like I said I am not a frequent LinkedIn user so this will do but even if I find myself using it more I won’t touch the App until it has a serious upgrade. Today’s App Review is Magisto by SightEra Technologies. 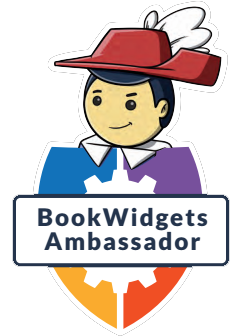 I am a massive fan of Animoto (previously reviewed HERE) and use it all the time both personally and in my classroom and up until now no video editor has managed to come close to offering as many features. Magisto is a definite contender here though. Like with Animoto you can use existing videos and photos or choose to take new ones. The free version of Animoto limits videos to 30 seconds and this is where Magisto has a clear win as it offers unlimited length videos. There are 8 free video styles to choose from and after picking a theme which may be the really cool traditional black and white old movie theme the App will then work its magic and create a video from what it considers to be the best bits of your movies. You can then choose music from the in-app selection or add from your device then your video is done. I tried one video with video clippings and it came to just under 3 minutes and it only took a couple of minutes to render and save. I hated my music choice but was able to go back and choose another. The only main improvement I would like to see is more themes or even an in-app purchase for more themes because there are only 8 styles which limits the App if you are using it often. The App has full social media integration so you can share your videos with friends. If you want to save the videos to your camera roll you have to pay 89cent each or opt for the alternatives of €4.49 for a month of unlimited downloads €15.99 for a year of unlimited downloads. Magisto can be downloaded from HERE. 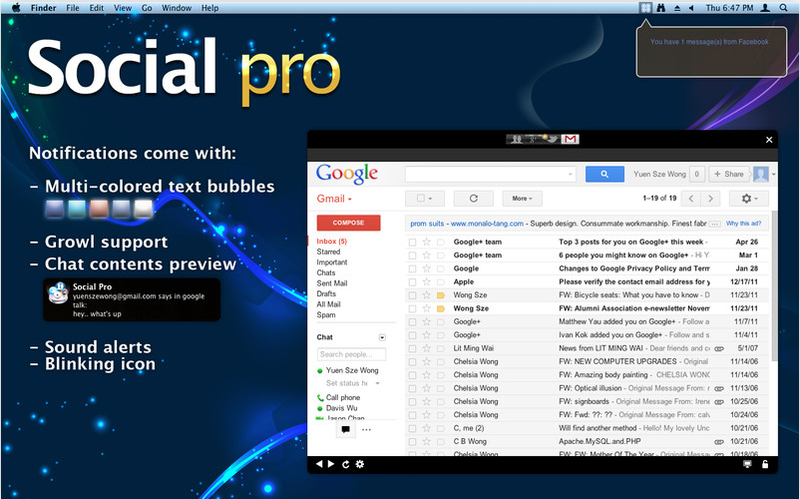 It has been a while since I have done a Mac App Review so have decided today to review Social Pro by Grandsoft. I have been using the App for about a week and it works fantastically on Facebook and on Twitter but sometimes misses my mails in gmail which isn’t a big deal since I have Mac mail doing this for me but it would be good if all three features worked. I don’t use Google+ so can’t comment there. So now my Mac does the same as my devices and I can receive social media alerts right to it something which is not necessary but a handy feature to have and also means I no longer have to leave tabs open in my browser for these sites to update in. Today’s App Review is Qwiki by Qwiki. There are several Apps that can be used to make video slideshows but Qwiki has got to be one of the easiest and fastest to use. 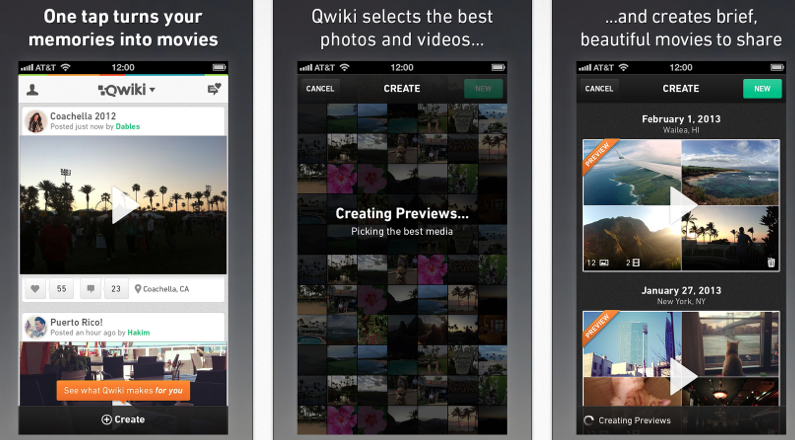 Qwiki can access your camera roll or social media photos and will create a slideshow in seconds. You have a choice of making a custom slideshow where you choose all the features yourself or Qwiki can do the job and create an auto one for you. And added feature is that you can add photo effects such as sepia, blue and greyscale. Photos can be reordered and captions can be added if you want. The App can access your music so you can add your favorite tune to accompany your slideshow. Once complete you can then email your slideshow, share it on Facebook or Twitter, email it or publish it on Qwiki’s servers. You can also search Wiki’s servers for videos made by others. 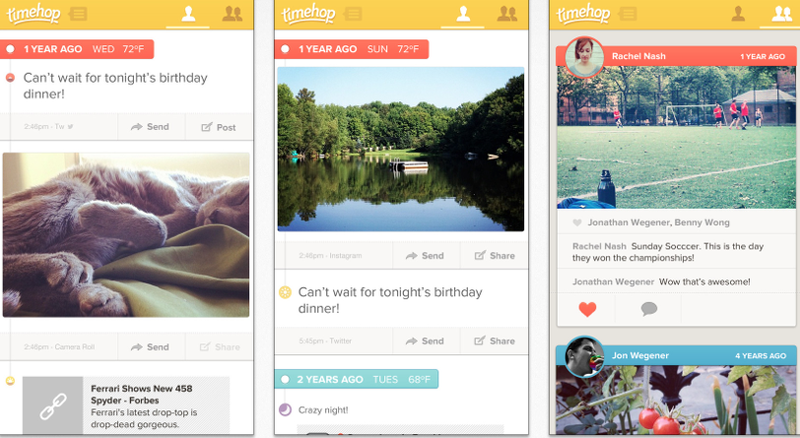 Today’s App Review is Timehop by Timehop. This App is definitely an A+ time-waster! There are so many social media Apps out there it is difficult to stumble across an App that is that little bit different and fun. Basically what Timehop does is it links you up to your accounts on Facebook, Foursquare, Twitter, Flickr or Instagram and as the name suggests the App hops back in time to a previous status update or picture. I chose to activate Facebook integration and I can tell you that one year ago I ‘picked up Tigger cat and he sneezed on me 6 times. Yuck!” Do you need to know that? Probably not! Did I need to be reminded of that? Well probably not either. However, it is pretty cool that I can do that because although Facebook’s timeline is intended to work like that it kind of fails in accuracy. Now what I really like about this is that it will also take news stories from previous years and give you facts. For example it told me that in 1936 ‘The Baseball Hall of Fame elects its first members…..” Then underneath I can see what that reference would mean in 2013 where it says ‘No one is inducted into the Hall of Fame this year, after allegations of steroid use.” Oh how the world has changed!! The App has full social media sharing integration so I can then choose to share any of this information on Facebook, Twitter, SMS or mail. There is also in-app sharing so that if you have friends that use the App you can share on each others feed. The one downside of the App is that it takes you to whatever day it wants to share information from. For example right now I am only seeing information from this day last year. It would be cool if I could skip to say 2009 or last April or whatever chosen date. If that feature gets added then it would definitely be the best Social Media feature App out there. Today’s App review is Social Stats by 77 Agency. I use Social Media statistics in my class all the time and students have to look up facts for their research projects so it is great to have discovered this App which includes them all region by region. For example a simple search I did showed that 422,280 people aged 22-38 in Chile like Facebook for iPhone. Another search showed that 13,800 people aged 13-38 in Central African Republic like Justin Bieber. This compares to 1,125,90 people of the same age group in the UK. The App uses Facebook data, likes and ad campaigns to calculate these statistics. It is interesting to just have a look at as an individual but can also benefits businesses who may be looking in to starting a Facebook ad campaign. I would definitely recommend download this App even just to see how many people like your favorite food or music. Although I have a Dropbox account which I use constantly on my laptop I rarely used it on my iOS devices and couldn’t see much point as to why I would. CloudOn App is much more functional than your typical viewer. As well as being able to access DropBox or Google Drive documents you can also edit them in Microsoft Word, Powerpoint or Excel formats. As well as being able to edit existing files the App can also create new files in these same formats that can be saved to your Dropbox or Google Drive and accessed later. 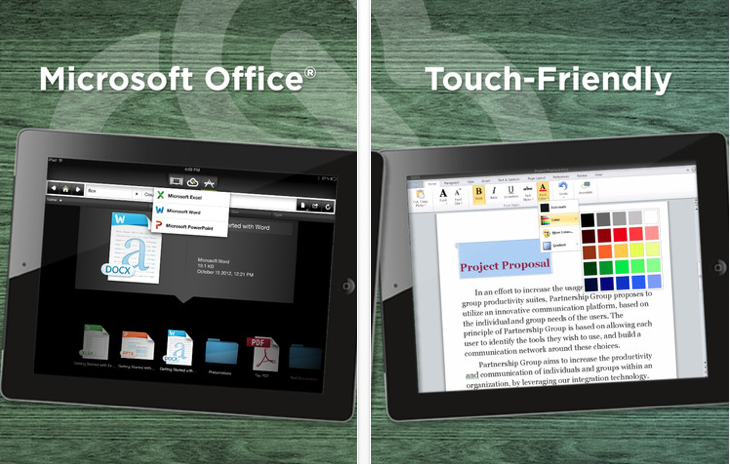 The fact that this App has fully functional versions of Microsoft Office Applications means that you can cut out any other Apps you used for this and have it all in one App. The best part is unlike other word processing Apps this cloud storage and file creating App is totally free. 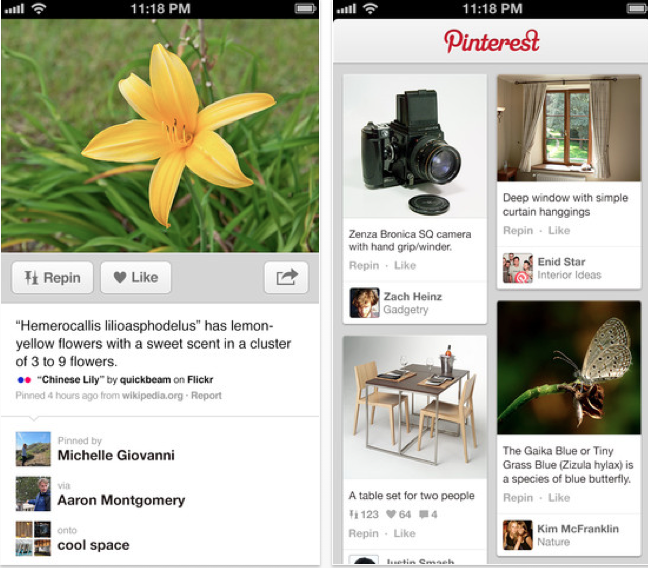 Today’s App Review is Pinterest by Pinterest. Pinterest has taken the world by storm over the past year and recent statistics by Nielson show that people spend just as much time on Pinterest as they do on Facebook. I never saw much point in using this social networking platform until I decided that it could be a quick and easy way of organising photographs. I drag and drop pictures to my computer desktop all the time. I also save pictures to the camera roll on my iOS devices but they just end up lost in a pile of other photos and I can never find them fast enough and usually end up giving up. Pinterest allows using to ‘pin’ pictures on a board. That way it is as if all the photos are in a folder and you can access them at any stage. This is great for showing friends or during class presentations and have as a organisational tool helped me keep all my images in the right easy to find locations. To download the App you can visit here. 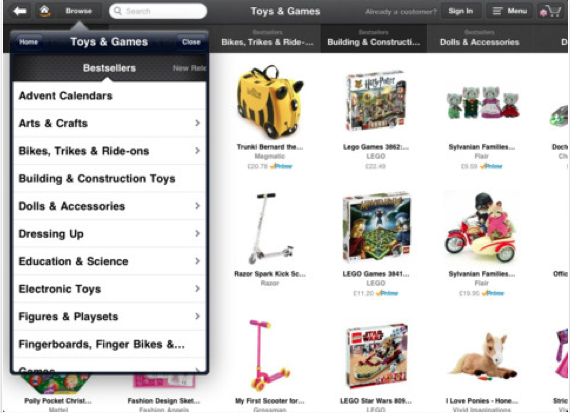 Today’s App Review is Amazon Marketplace by Amazon. This App has the potential to be very good and in a way it is great if you have no idea what you are looking for an just want to window shop but the search function isn’t that fantastic and I often find myseld being led in an entirely different direction than I want to be. Overall I found that the regular Amazon shopping App works a lot better for what I need which is generaly when I am in a shop and want to check if the electronic or DVD deal of the day is really a deal or if I can do better but other than that neither App are as good as the desktop versions. Another disadvantage to this App is that your bank account can receive an unexpected blow when you see something you think you need but you really don’t but of course this can be said of all shopping Apps. The App is free so can’t hurt to try it out. Personally it is not for me but it is worth a look around.